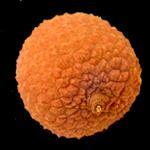 The litchee is a round fruit, of 2.5-4cm of diameter, native to the east. It is red and the skin is rough. It has a white, sweet and juicy. It is usually eaten raw, although in China it is cooked with meat and fish. It is also used to prepare ice creams or milkshakes. It supplies vitamins and minerals to the organism. The litchee has multiple healing properties. For such purposes, people use the fruit, the bone, the rind and the roots, and they are both applied externally or internally. They heal, among many others, stomach aches, hernias and throat sore. 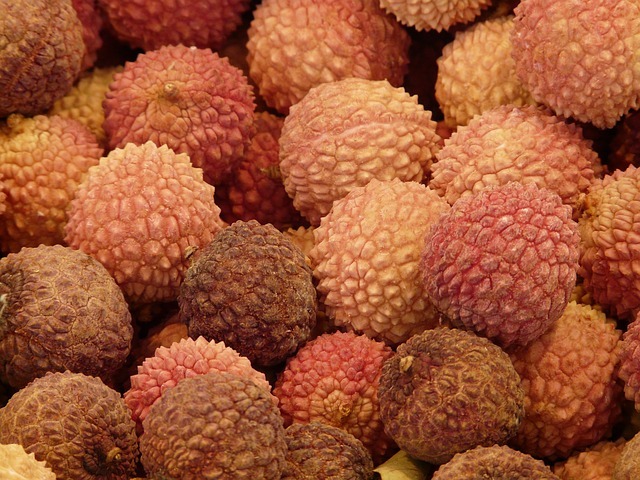 The litchee is a round fruit, of 2.5-4cm of diameter and 20g of weight, native to the east. It is red and the skin is rough. It has a white, sweet and juicy. It is usually eaten raw, although in China it is cooked with meat and fish. It is also used to prepare ice creams or milkshakes. It supplies vitamins and minerals to the organism. The skin is generally red or pink, covered with small wrinkled protuberances, resembling the strawberry tree fruit. The pulp is white, firm and somewhat hard, carrying a seed inside. This fruit has a sweet and slightly acid taste. It is usually eaten raw, as fresh fruit, although it is also consumed in fruit salads. In the Chinese cooking, litchees are cooked with meat or fish. They are also used in the manufacture of ice creams. They are dried or preserved tinned in syrup. It is rich in vitamin C and B and in minerals like potassium, calcium, magnesium, iron, copper and phosphorus. The fruit, the stones and the roots are used in medicine, since it has multiple benefits for the organism. The litchee is a Sapindaceous tree; its scientific name is Litchee chinensis. It measures 10m, and has a thick, straight and short trunk, tending to the formation of low branches. The bark is of a dark brown colour. The flowers are of a greenish white or yellowish colour, bearing showy and bright red fruits. The leaves are alternate, with a variable number of folioles. The shape, size and number of folioles are the characteristics used to distinguish the different varieties. The flowers are grouped in panicles of a greenish white or yellowish colour. They blossom at the end of winter or beginning of spring and there are three types: masculine; hermaphrodite flowers that mature as if they were feminine and hermaphrodite flowers that mature as masculine. The fruit is an ovoid drupe, 5cm long and of 4cm of diameter. The weight ranges from 10 to 35g. The skin is of bright red colour and covered with pointed protuberances. The pulp is white, translucent, juicy and sweet. The seed is bright, of dark brown colour. The litchee sprouts several times a year. The sprouting of new branches begins towards the middle of summer and continues until the spring blossom.